Did you watch "Linsanity, the Movie"? If not, hurry before this round of screening is over in your area. Although I already viewed a pre-released screening on June 1st with the Chinese Entrepreneur Association, I enjoyed watching the movie again in Cupertino with some pre-teen and teenage girls. I pray that one day they might also be known for their faith while doing what they love. At that event in June, I ran into old friends and met new people. I was proud of Jeremy's mom, and I was surprised to see someone who I haven't seen since 1974. That summer, I worked at her parents' restaurant in China Town to earn money for Berkeley. Not only did they give me a job, they also let me stay at their house, and their daughter (who was in high school) walked home with me in mid-afternoon very day. Although I visited her parents a few times when my son was young, we lost touch. How did I connect with such kind people? My godmother knew someone who knew them. This loving family helped me escape from working graveyard shift sorting fruits in a factory to becoming a cashier at their take out counter. I feel sad to hear about their passing, but thank God for sending His angels to help me. Long before I understood His grace, God had placed me in various Circle of Kindness! My life has not always been easy. I grew up in an environment where girls were not valued, my parents had marital problems, and there were tragedies and sudden deaths in our family. It is caring adults like these who gave me hope. Do you know someone suffering in life because of improper parenting (or grandparenting like in my case)? Maybe you can make a difference in their life by being that one caring adult who gives them help and hope! It was August, 1973. The day before I left Hong Kong for college in California, my mom insisted on ironing all my shirts by herself (even though our family had a maid). Suddenly Mom cried, "Oh no!" I rushed in, saw what happened, and yelled, "Why did you do that?" I walked away to conceal my disappointment -- my favorite blouse was ruined! Then I felt really guilty yelling at Mom. Why did I do that? I was sitting there dejected when her gentle voice called, "Your blouse is okay. Look..." She had cut the burnt tip off and made both pointed collars curved! The next day we hugged and bid farewell. Two years later, she died of heart failure while I was still in college. Yet her love lives in me and sustains me. 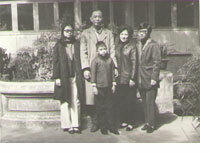 I treasure our last family photo taken a few months before I left Hong Kong with me standing next to Mom. Who could imagine I would never see her again after coming to California? I always knew Mom loved me. That day when I yelled at her, somehow she knew I was anxious about going to the United States and she forgave me for taking things out on her. Her love helped me years later to understand the greater love of Christ – 'But God demonstrates his own love for us in this: While we were still sinners, Christ died for us' (Romans 5:8). There is a Chinese saying, "Under heaven, there are no parents who do wrong" (in ping yin: "Tian xia wu bu shi de fu mu"). I know how most of you care about your children and love them more than yourself. But I have to point out that there is improper parenting in the Chinese culture. Because parents are usually the first influence in our lives, what we learn or do not learn from them when we're young can have lasting repercussions. Unfortunately, this can translate into many people suffering from the effects of improper parenting. If not addressed, those effects can be felt for a lifetime, and they include low self-esteem, being drawn into abusive relationships, unhealthy habits or inhibitions and feelings of worthlessness. Improper parenting can include physical, sexual and verbal abuse, physical and emotional neglect, rejection, favoritism of one sibling over another, lack of discipline, forcing choices on children and being overly protective or indulgent, and of course, favoritism of one gender over another! Because we often parent as we were parented, it's important to heal our own wounds and learn proper parenting techniques so that we don't perpetuate the cycle. As P.D. James wrote in Time to Be in Earnest, "What a child doesn't receive, he can seldom later give." How, then, can we heal from improper parenting, thereby making ourselves whole, happier members of society as well as better parents to the next generation? Embrace the recovery process. Whether you decide to seek pastoral counseling, professional therapy or learn coping techniques on your own, realize that the process will take time and effort on your part. Be patient with yourself and don't expect perfection. Don't blame others. We cannot thrive in the present if we are living in the past or blaming others for our problems and conflicts. Even though we could not control the first years of our life, we also should not blame others for the choices we have made. We have to learn how to take responsibility and work through the traumatic feelings from the past that continue to haunt us in the present. Identify and remove mental and emotional blocks. Through therapy, journaling or other techniques, it's important to probe the unprocessed issues from childhood that continue to negatively impact you and block you from leading the life you want. Learn new strategies. Realize that the process consists not only of learning the right behaviors, but about being a whole person. That means taking reasonable risks to build your emotional confidence, self-esteem and self-worth. Personally, my mindset and perspective changed when the Holy Spirit spoke to me through the Bible -- the word of God. Growing up all over again. Essentially, it's almost like going through the growing up process again, but this time, doing it the right way for you. Self-help books may urge you to learn to rely upon yourself to give yourself what you need or what you feel you have been lacking. But we need a grace environment to grow, so take it one step further to be re-parented by someone who is safe and trustworthy. Ultimately, this is why we all need to be re-parented by God. Forgive. Forgiveness can be a controversial issue. Some regard it as necessary for healing; others say it is not. At heart, forgiveness is a process that frees you. It's not about condoning the way that you were parented, but about understanding the roots of your parents' behavior, letting go of the past and moving on. Whether or not you decide to forgive your parents, do try to forgive yourself for any choices or behaviors you may regret. You might even reframe any regrets as opportunities for growth and learning. Share your story. Support groups are an excellent opportunity for you to share your story with others in a safe environment. It can be helpful to reach out to others who are suffering or who can understand what you're going through or have gone through. Regular attendance of church fellowship and small group could help! It is very difficult to be a good parent and set up an effective model for our children until we go through the recovery process ourselves. However, once we begin to heal and let go of the mistakes our parents made in our childhood, we can not only break negative parenting cycles and become better parents, but better functioning human beings as well. It is about truly learning how to love and accept ourselves so that we can in turn love and accept others.